I love experimenting with and learning different cooking techniques, especially if they involve playing with yeast. No Knead Bread? Yes please! Artisan Bread in Five Minutes a Day. Made that. Sourdough from my own starter? Still bubbling quietly away in the fridge. But grilled or barbequed pizza? Not yet – that was until I was sent a copy of Craig Priebe’s Grilled Pizzas & Piadinas. 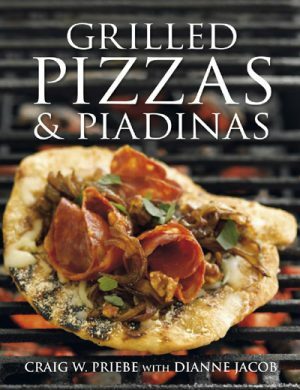 Craig developed his grilling technique, using a barbeque, when he ran his own pizza restaurant in Atlanta and this book explains it in detail. When we did the pizza day in Ballymaloe, Darina cooked one of her creations on the barbeque outside the demo theatre door but, more fascinated by the wood-fired oven, I didn’t hang around in the rain, instead directing my attentions indoors so I never got to investigate the barbequed pizza properly. Wanting to put this cookbook to the test (sometimes, when piles of cookbooks start stacking on the stairs, next to the bed, all over the kitchen counter and on the dining table, the Husband asks why I don’t spend less time reading cookbooks and more time actually using them) I decided to make some dough on Sunday morning for a Sunday night pizza fest. It took minutes in the KitchenAid, although I had to add a lot of extra flour – perhaps something to do flour stored in American kitchens being much drier than in Irish cottages at the end of a long, damp winter. After a couple of hours on a warm window sill, the dough was landed into the fridge and sat there all afternoon, firming up enough to handle. When we got home that evening it was raining too much to pull out the barbeque so I dragged out my big, heavy cast-iron frying pan and heated it up while the Husband mixed some of Craig’s Herbed Grill Oil. The pan is not quite big enough to cook 12-inch pizzas so, instead of two 12-inch pizzas we made three 10-ish-inch rounds out of the dough – next time I’d make four thinner ones. As everything came together faster than expected – Craig did warn me, I just hadn’t read that piece! – there was a bit of juggling with temperatures on the pan, topping ingredients on the counter and finishing off under the grill but, much faster than expected, we finally had a selection of decent pizzas to sit down to. I discovered that basil pesto and marinated feta, combined with Craig’s Herb Oil, makes for an overly greasy pizza but goat’s cheese, roasted red pepper and Caramelised Onions are a winning combination. Hegarty’s Cheddar, with thinly sliced salami (Gubbeen, for preference) and Tomato Chilli Jam also worked out well. Next time I may even be organised enough to try a few of Greg’s own ideas for toppings – spinach, pesto, mushrooms and feta sounds good, as does sausage, pepperoni, artichoke hearts and peppers. The book also includes a selection of salads (I’ve already got my eye on Baby Lettuce with a Citrus Peppercorn Dressing) and deserts (Cinnamon Churros, grilled pizza style) to accompany the pizzas, alongside recipes for the Italian-style flatbreads called piadinas – something to try out for next Sunday, perhaps.